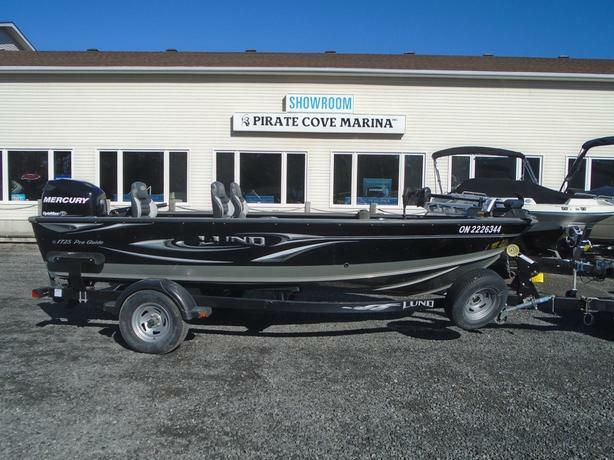 This one owner LUND Pro Guide 17'4" Tiller Lund is at ease in calm or rough water making it a hard-core walleye, muskie, or bass fishing boat. With an extremely roomy interior and plenty of storage, this Pro Guide is a fisherman's dream. It Includes 3 upgraded Pro-Ride seats, vinyl main floor, bow baitwell, livewell, and an 80 lb Minnkota Fortrex bow mounted trolling motor with bow Humminbird 788. The Pro Guide's electronic command center is mounted with a Humminbird 858 GPS/Sonar, stereo and full lighted instrument panel. The Mercury 75hp Optimax comes with a Big Tiller Handle. The package includes a Shoreland'r bunk trailer with load guides, swing tongue, and spare tire. Ready for a great day on the water.